HOPING to enlighten the local community about the vegetarian way of life is The Black Sheep – a new, meat-free restaurant in Gloucester Road. 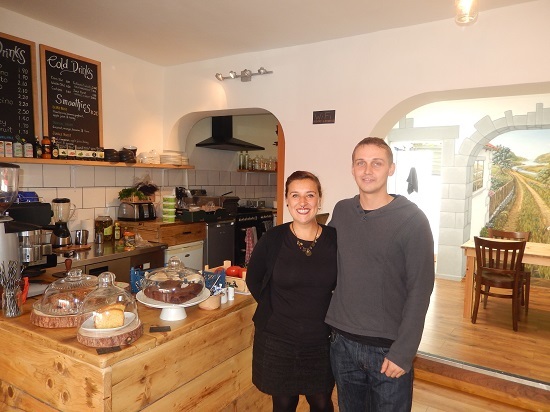 The café, on the stretch of road opposite the Promenade, is the brainchild of Mayte Gracia, 34, and Andy Jessep, 28, who fell in love through their passion for vegetarian cooking. Mayte came to Bristol from Spain a year and a half ago because of poor job opportunities in her own country. A friend offered her a temporary room to rent at their house, where Andy also lived. The opportunity to establish their own vegetarian eatery arose when the property, which was previously a Turkish café, came on the market earlier on in the year. The pair chose the name ‘The Black Sheep’ to reflect how they have sometimes felt, being vegetarians. A vegetarian for over 17 years, Mayte said: “In Spain, you get laughed at in restaurants for being a vegetarian, so I always felt like a black sheep. I used to have to read all the labels in supermarkets to make sure they didn’t contain meat. It was practically impossible trying to find vegetarian food. Mediterranean flavours are heavily prevalent in the café’s tapas menu, from traditional patatas bravas and a trio of dips with Sevillian picos, to Mediterranean inspired onigiri (Japanese rice balls) and marinated chupadeos olives. There is also a selection of burgers, including a quinoa, avocado and beetroot burger, as well as salads, soups and puddings. Vegan and gluten-free options are aplenty, with ingredients – all locally sourced – including vegan parmesan, homemade vegan garlic mayonnaise and raw fruit ice cream. The Black Sheep has also recently drafted in the help of Isabel Bryant from the Mighty Food Fight – a vegan food van – who will be assisting Mayte in the kitchen. Mayte’s love of cooking was inspired by her mother. “My mum taught me everything I know – I practically grew up in her kitchen. She is an amazing cook. “Before I came to Bristol, I found her a small place in a market, where she could sell her flavours – that is all she wanted to do. Andy added: “We hope to open people’s eyes, and show die-hard meat-eaters that there is another way. We hope to make people more conscious about their food choices, and to experiment more in the kitchen.